I pulled a 11 hour stretch yesterday to finish my school work so I could be free of homework until next Monday. I somehow survived! Now, I can play and swatch. I have a ton of swatching to do. I have Models Own Beetlejuice, Sally Hansen Nail Prisms, and more to swatch. 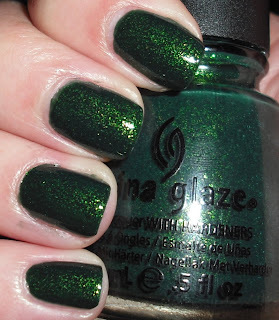 Anyways, I have a really pretty China Glaze holiday polish for you today. Guess what? It's green! You know what else? I love it! Glittering Garland is a deep forest green with a lighter green and gold glass fleck glitter. I don't just like this I l-o-v-e this. It is stunning. It is beautiful. It is definitely a must have. The formula was great. You need this polish. The end. I really like the gold glass fleck with the deep green color (: It looks great on you! I can't wait to wear this color. Such a gorgeous green! Well if you like it then I probably would. We feel the same about greens lol! It looks so pretty in your picture! I *love* this polish on you! I've been trying to talk myself out of it, trying to convince myself that I don't need it. I think I just failed. I wasn't that impressed with this shade just by looking at the bottle, but you on your nails it is gorgeous! I just picked this one up today, so I can't wait to wear it! I'm also looking forward to seeing your Beetlejuice swatches. Such a gorgeous colour. It reminds me of sally hansen project runway.